It’s not difficult to conjure up an image of a place that shouts of the life experiences of its owner. Amnon Weinstein’s workshop is such a place. Sometimes there is no need for a person to be in portraits. As you experience the exhibition, I wish for you to consider even the inanimate subjects to be portraits. In 2014, when Israel Weiner told me about Amnon and his Violins of Hope project, I was in awe of Amnon’s vision. It was difficult to understand how much investigation and commitment Amnon had given to these violins. Amnon’s life project is inseparable from metaphor. It is metaphor. As a photographer, I miss the tactile/visceral qualities of silver photography. To me, the process of developing film and printing photographs was ritualistic and meditative. While this is as wonderful a time as any to be a photographer (photography has never been more popular and democratized as it is today), I feel a great loss for the delicate emulsion that had so often run through my fingers. I miss the smell of fixer and the sound of the darkroom’s water flowing across my darkroom trays. Since its invention, photography has always been a multisensory process for the photographer, no matter the subject being explored by the camera. These aspects of photography are now gone with the loss of the darkroom. A luthier’s (violin maker’s) workshop is unique in the 21st century. All the tactile qualities that I miss in my process of making art fortunately have remained for the violinmaker. For this I am happy for Amnon, although I am more than a bit envious. Amnon’s father Moshe immigrated to Palestine in 1938, opening up his own violin shop in Tel Aviv. What a dream it must have been for him and for his wife Golda. But the dream was short lived, for after the war was over, he was informed that his entire extended family was murdered by the Nazis, over 400 relatives in all. Moshe was the family’s first luthier. Today there are three generations of Weinstein violin makers, although Moshe has since passed away. Amnon’s son Avshalom works half of the year in the family workshop in Tel Aviv. The remainder of the year, each year, he travels to his own workshop in Istanbul, Turkey. Amnon is not just a luthier, but a true master in his field. On any given day, he might receive a violin or cello delivery from an international soloist. Though he has many celebrity clients, Amnon is just as interested in helping the yet unrecognized youth in music. He is an extremely generous man. Call it a perfect storm, serendipity, or something far less dramatic. Amnon and his wife Assi’s remarkable histories, combined with Amnon’s unique artistry, gave him the opportunity to have an epiphany 20 years ago of what he must do. All of these strings of Amnon’s life intertwine for him, just as braided challah dough becomes one. He needed to find and restore as many violins from the Holocaust as he could, and research their owner’s histories as well. Not an easy task, considering that along with death typically comes an end to memory. I cannot imagine exceeding the emotions that must have filled his soul when he and Assi flew to Berlin along with so many restored violins that were themselves survivors (even if their owners were not). There are no words to express the significance of having the national orchestra of Germany during Hitler’s rein (the Berlin Philharmonic), perform on these violins to commemorate the 70th anniversary of the liberation of Auschwitz. Yet what Cleveland has done with Amnon’s dream is nothing short of remarkable in comparison. There is no doubt that the massive collaborations between institutions such as The Cleveland Orchestra, Case Western Reserve University, WVIZ and WCPN, Groundworks Dance Theater, the Maltz Museum, The Cleveland Institute of Music, MOCA Cleveland and countless school systems in N.E. Ohio, is historic in regard to Cleveland collaborations. The educational experiences that will result for people of all ages, races and socio-economic backgrounds are immeasurable. It is my hope that this photographic exhibition will also play a role in this education. Certainly each of the Cleveland programs could not have happened without Amnon. So in a sense he is an equal partner within each performance, dance, panel discussion and play. 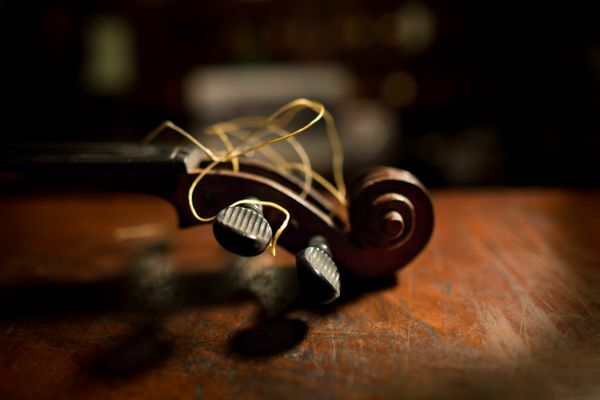 But this Violins of Hope photographic exhibition is all Amnon. That being said, it is only a small representation of this master Luthier, of this human being with a capital H.